Sunningdale, Wentworth and Walton Heath are the only clubs in the whole of the British Isles other than the Berkshire Golf Club that can boast about having two heathland golf courses positioned in the British Top 100. It’s an amazing surprise that so few people know how charming the Berkshire experience really is. Herbert Fowler was the Berkshire’s architect and the Blue course opened for play in 1928. Fowler was actually very good at designing excellent twin golf courses. Not only did Fowler design both courses here at the Berkshire, but he also designed the superb intertwined courses at Walton Heath, the Old and the New. Both the Berkshire courses have the same natural hazards, although the Blue plays over flatter ground than the Red. Cruelly, the Blue opens up with an exceptionally tough par 3, with the tee directly in front of the clubhouse window. The green sits on a distant plateau. Not the easiest hole on which to start a round of golf – play the Red course in the morning to prepare for it! There are many other notable holes on the Blue course but it’s the closing sequence of five holes that makes this a tough but special course. All five are par 4s and three of them are more than 400 yards long. It could be argued that the Blue has a similar but less acute weakness than her brother the Red – the three par 5s on the Blue course are very short indeed, the longest measures only 477 yards. However, short par fives aside, the Berkshire is the most delightful place to play 36 holes of golf, perhaps only surpassed by the pairing of Sunningdale’s Old and New courses. Like its sister course is in great condition . Plays very fair but beware of the heather again . Superb tree lined course well worth a visit although it's not particularly cheap. A full day of golf (and lunch) at The Berkshire is one of life’s little luxuries and definitely worth saving up for. I played both courses on the European Amateur Golf Tour so not only did I get to experience both courses in their best condition but also under competitive conditions. I had previously played the Blue course many years ago so it was nice to be reacquainted with this excellent layout that enjoys some delightful holes, especially on the back nine, and makes a more than solid partner for the superior Red course. The best holes on the front nine of the Blue are the opening par three, played over a heroic carry of heather, and the tricky short par four ninth where an approach from 100 yards is often preferable to one from much closer to the lofty green. The holes in between are all solid and require plenty of thought and positional play but lack the undulating ground that the rest of the course has and which brings it alive. The run of holes from the 11th onwards are really what define the Blue in my eye. They are all energetic holes and there is more going on over this closing stretch than what has gone before it. The 11th is a lovely s-shaped par five whilst the next is one of few holes on the entire property that is played across a side slope and also has a fascinating two-tiered green; high at the front and low at the back. Having taken my society there for the past 2 years playing at the Berkshire can only be described as a golfers paradise. The greens are pure, the heather is thick but forgiving, the fairways are cut to perfection and most importantly, you feel like you in a world of your own for the day. Playing as part of a society we are looked after as good as we could hope for and the 3 course carvary, keeps my mouth salivating for the 12 months in between rounds. 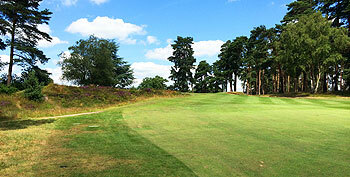 In my opinion this rates above all three Wentworth courses and Sunningdale, I can't wait to get back again this July. The beauty of this site is all about opinions. This is an interesting view expressed and one that I am very curious to know how it was reached. The Berkshire is a fine club with two very good golf courses but I struggle to see that it rates above Wentworth or Sunningdale. I don't like the changes to the West but the East (hopefully one day renovated so everyone can enjoy the Colt gem it is) and the Edinburgh are excellent courses - one long, one shortish ; one old-school design, one new etc. Sunningdale - Old and New have all the qualities you ascribe to the Berkshire in spades (conditioning, beauty , playability) and no road intruding behind a green. Curious to know whether this reviewer has ever played Swinley Forest and how he/she would rate it against the Blue. Sunningdale being a Surrey club, Swinley Forest is no 1 in Berkshire in my view. I respect the opinion offered here, but beg to differ. This is one of two fine courses on the property, but the challenge and variety here could not, for me, remotely match that at Sunningdale, let alone rate above it. 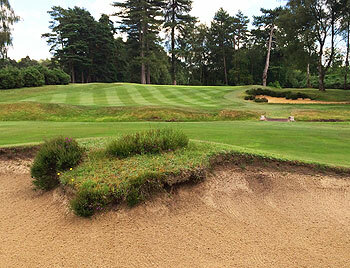 To take two examples, can you really rate the appalling redesign of the 10th here above the 5th on the New at Sunningdale, as brilliant a short hole as exists in the UK? Is the 17th here, where perhaps a third of the fairway is in play, really a hole to remotely match the outstanding dogleg right 15th on the New, with the wickedly positioned pond for the slightest cut? Can't see it myself. James, you point about the 10th is spot on. When it was built a couple of years ago, the club went to great lengths to boast about how it was a wonderful addition to the course but it has ruined the place. It has absolutely no respect for Fowler's architecture. The green is completely alien. The swales are straight out of a Pittsburgh municipal. The bunker is even worse than that. I played there a month ago whilst in the U.K. They have removed the tacky heather beds on the hills but that is a tweak of the look whilst the core architecture is horrific. I always thought the Blue to be a wonderful test of strategic golf. To add to this mistake, they have added in a back tee on 18 that defies belief. I don't know of any Fowler strategy that includes only being able to see half the fairway and they have forgotten that there is a big cross ditch at the point of landing (for mortals like me anyway). i asked a few questions when I was there and bumped into a member who knew a huge amount about Fowler and the history of the place. Turns out that they fired the architect that screwed up 10 but have brought in a guy called Lobb, who is a new build guy. As the original reviewer, I appreciate all of the comments on the above, maybe i had been slightly Naive in my comments after returning last year. Whilst no doubt I cannot wait to return again this year, we had a small problem with the members last year, being put out behind a couple of 4-balls of members, we ended up having a 5 and a half hour round. I stand by my comments about this in comparison to Wentworth, but would retract my Sunningdale comments. I was fortunate to play Swinley last September and completely fell in love as that sits on a different level to The Berkshire. This is still without a doubt, one of the countries elite establishments for a day of golf in luxury, and anyone who get's the chance should take it in a heartbeat. Once the stuffiness of the older members disappears, this will be on my target list for membership. Everyone goes on about the Red Course and its 6/6/6 format but the Blue is a tougher test I reckon. 17 beautiful holes only ruined by the new par 3 10th. I play the course once a year in a society day and was staggered when I saw what they have done to the hole since I was last there. It looks like a reject hole from Wisley or such like. Out of place, impossibly hard and ugly. A bit harsh, but I agree with all that. The problem on the 10th was thinned shots from the (late lamented) front-right bunker ending up on the A322 - a calamity and a big lawsuit were waiting to happen. But it's a very good golf course. The Berkshire Blue was one of the few remaining classic Heathland courses in the East Berks/West Surrey borders I had left on my must play list. I knew, if it’s sister course, The Red, was anything to go by, I would be in for a treat - and playing the course a couple of days after The Berkshire Trophy (a prestigious amateur event attracting only cat1 players) meant the course was going to be in spectacular condition. I was informed by the pro and the secretary there had been an extensive clearing program and many rhododendrons had been removed from the surrounds of the course to return the original spacious feel. This was noticeable as it made the course extremely playable and relatively forgiving off the tee. Having said that, from the outset the course rewards straight and accurate golf. It’s possibly one of the fairest of the heathland courses I have played, whereby an errant shot can be recovered, even from all the bunkers, which are well sanded and well placed, but if you allow one error to lead to another almost every hole has the potential to become a card wrecker. Although the par 3 1st offers a large target area a poor shot is heavily penalised, with a serve drop off to the right, bunkers on the left and a 150 yard carry to avoid the heather. The first third of the course offers holes with variety in length, orientation and shot selection, resulting in an equal mix of par 3’s 4’s and 5’s through the first 6 holes. This run of holes offer ample birdies opportunities if played well, but any lack of concentration or precision will certainly cause a dropped shot at best. The front 9 finishes with 3 strong par 4’s, the final of these playing uphill 310 yards with a green so well-protected that there really is no easy place to play your approach from. The back 9 begins with a very inviting downhill par 3 with a front to back sloping green. Anything past the pin here leaves a treacherous putt making a par a good score, but keeping short of the pin should present a chance of a birdie. You then make your way through another strong selection of varying holes, the highlight for me being a beautiful yet dangerous par 3 13th. With so little room on the left the tendency in our group of right handers was to fail to commit to the shot and find your way into the sneaky bunker short right. The final stretch home consists of 5 consecutive par 4’s starting with a blind shot on the 14th. The ideal tee shot is your 210 yard club, 10 yards left of the market post. If the pin is short right don’t go for it, even with a short iron, keep left of the pin as the run off from the front edge swallow’s up everything and spits it out at the bottom of a 5ft swale! I regret that the 10th hole has been altered since you wrote this. It's a complete mess. Sadly, they have started tinkering with several holes on both courses. The bunkers are nigh on unplayable and look like they are from a different designer and era. The original Fowler holes are wonderful but the altered holes are an eyesore. Great shame that they haven't employed Hawtree or Coore or such like to do it properly. The Berkshire is a great club and has two very lovely courses. The highlight is the 1st on the blue for me - which is an intimdating shot over a valley of heather - right in front of the watching crowds washing down their breakfast with a few laughs at your expense (can you tell I topped it? ).The course is very beautiful and a treat to play - very much in the same vein of some of its sister courses in the area. Certainly one to play. This is tougher than the Red course here, but not quite as nice or memorable. A few holes on the front 9 are affected by a lot of traffic noise and aren't quite as good as all the others here. The back 9 is very nice and probably the hardest of the of the four 9's here. Theres lots of long uphill par 4's, which require your full attention. The 1st hole here is also worth a mention, 200+ yard par 3 with heather all the way to the green, tough start!! Great way to spend a day, 36 beautiful holes of golf at The Berkshire. A day of 36 holes golf on the 2 courses at the Berkshire is a golfers dream.The Blue is the tougher of the 2 in my opinion.Great. I unfortunately didn’t get the chance to play the knee-trembling first hole on the Blue course as both it and the second hole were closed for what appeared to be quite extensive drainage work but I did feel fortunate to be allowed to play the remaining holes from 3 to 18, even though the course was officially closed – which meant my playing partner and I had the place to ourselves! After playing the Red in the morning, the early holes on the Blue by comparison in the afternoon did not provide quite the same thrilling golf experience. Holes 3 to 9 play a little more on the flat and its true to say the front nine are, collectively, not as strong as the other three nines on the property, but – let’s not get too picky here – they are all very decent holes. It’s a shame a very busy main highway runs just yards behind the green on the 10th – surely some mounding/tree planting could alleviate part of the visual and sound distraction here? The double doglegged par five 11th is a real cracker, with a wicked two-tiered green and big bearded bunker to the right of it then the blind tee shot at the 14th begins a very testing sequence of five par fours to complete the round. These are all strong holes, particularly the 452-yard 16th where a burn protects the elevated green – great stuff! Despite being pegged back at the last to finish all square (having been dormie two!) I came off the 18th green beaming ear to ear as I’d just played 34 very enjoyable holes on two great courses, managing to retain the same ball I’d started with – a triumph of epic proportion here! Once the clubhouse refurbishment is finished, you will be able to really savour the full Berkshire treatment, both on and off the courses. It's very worth saving up your pennies for a 36-hole golfing away day here.